Presidio Park is a historic park in San Diego that dates back to when California became a state. It has a lot of green areas and hills that provide nice views of the surrounding San Diego area. It is also a short distance to Old Town. The trails are unpaved and if you walk on the side of the road you have to be careful because there is no side walk and the vehicle roads are narrow. My wife and I hiked Waterfront Park as a park of a much longer urban hike through San Diego. Waterfront Park is a small municipal park around the County Building. 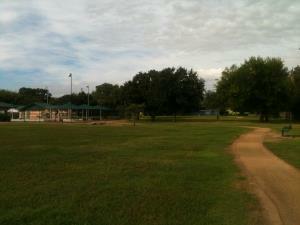 It has green areas, a playground for kids, and a space where a lot of outdoor concerts are held. My wife and I hiked through Morley Field as a part of a bigger, longer Balboa Park hike. Morley Field is a large sports complex that features a disc gold course, 25 tennis courts, a swimming pool, boccie courts, a velodrome, and many other amenities.